The ultimate goal of materials chemistry is the understanding of the macroscopic properties of materials in terms of the microscopic molecular interactions. This is a common theme in all of the natural sciences. The differences between the various scientific disciplines (chemistry, biology, physics, materials sciences, etc.) often disappear as the traditional macroscopic phenomenology is replaced by a more molecular approach. At present, most of what is known about the chemical and physical properties of materials is still largely empirical, especially in the case of amorphous, macromolecular or interfacial systems. The development of a microscopic theoretical description for a variety of such complex systems is the primary focus of our research. Several representative projects are listed below. They are all projects in which great advantage will be gained by exploiting the natural symbiosis between analytical and computer-simulation techniques. 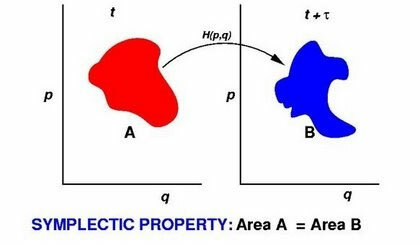 "Thermodynamics and Intrinsic Structure of the Al-Pb Liquid-Liquid Interface: A Molecular-Dynamics Simulation Study", Y. Yang and B.B. Laird, J. Phys. Chem. B (Jim Skinner Festschrift), 118 8373-8380 (2014). "Calculation of the interfacial free energy of a binary hard-sphere liquid at a planar hard wall", J.L. Kern and B.B. Laird, J. Chem. Phys., 140, 024703:1-7 (2014). 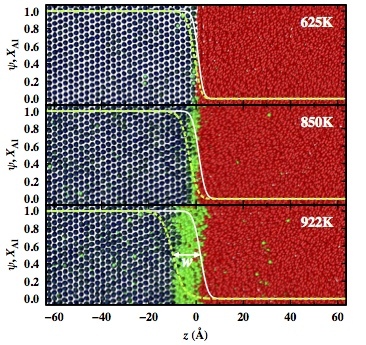 "Solid-liquid interfacial premelting", Y. Yang, M. Asta and B.B. Laird, Phys. Rev. Lett. 110, 096102 (2013). "Interfacial free energy of a hard-sphere fluid in contact with curved hard surfaces", B.B. Laird, A. Hunter and R.L. Davidchack, Phys. Rev. E, 86 060602:1-5 (2012). For the last several years we have been working closely with KUs Center for Environmentally Beneficial Catalysis, an engineering research center whose mission is the development and application of environmentally friendly catalytic processes for industry. Much of our effort has gone into molecular modeling studies to support the development of novel "green" solvent media for catalysis. One class of solvents that is of interest are so called gas-expanded liquids (GXLs), in which a large amount of gas (usually carbon dioxide) is dissolved into a traditional organic solvent, expanding its volume appreciably. The resulting solvents are environmentally beneficial in that they reduce the amount of potentially harmful organic solvents necessary to carry out a particular catalytic reaction. These solvent systems also have enhanced mass transport and reactant solubility properties over the neat organic solvents and over super-critical carbon dioxide. We have been using a number of molecular simulation techniques (Gibbs Ensemble and Grand Canonical Monte Carlo and Molecular Dynamics Simulation) to study the phase-equilibrium, structure and transport properties of these novel solvents. Recently, we have entered into a new collaboration with the CEBC funded by the National Science Foundation program Networks for Materials Synthesis and Design. This is a highly multidisciplinary and multiscale effort involving several KU research groups: two in Chemical Engineering (Subramaniam and Choudhary), two in Computational Chemistry (Laird and Thompson) and one Organic Chemistry group (Tunge).This highly collaborative effort uses molecular modeling, synthesis, reactor engineering, kinetic studies and life-cycle assessments to develop and optimize the design of industrial catalytic processes for minimal environmental impact. This framework is being applied to two examples of high-volume chemical processes. One is a safer, phosgene-free route to dimethyl carbonate, which is used to manufacture polycarbonates and polyurethanes. The other is a cleaner, more efficient route from butadiene to adipic acid, used to make nylon. The discoveries and methodologies developed for these two chemicals will also find broader impacts for other major chemical processes. Our theoretical/computational modeling will provide a detailed understanding of the molecular processes involved in the complex reactions, which are often inaccessible through experiment alone. For example, in a new synthetic route to DMC, ethylene is oxidized to ethylene oxide inside a catalytic metal-exchanged amorphous silica mesopore. Molecular simulation allows us to measure the nano-confined reactant system more easily than typical experiments allow. Generally, we are able to study the phase behavior, structure, and transport properties of these novel reaction environments. "Prediction of phase equilibria and transport properties in carbon-dioxide expanded solvents by molecular simulation", Y. Houndonougbo, B.B.Laird and K. Kuczera, Mol. Simul. 33, 861-869 (2007). "Transport properties in carbon dioxide-expanded acetonitrile from molecular-dynamics simulations", Y. Houndonougbo, B.B. Laird and K. Kuczera", J. Chem. Phys., 126 074507 (8 pages) (2007). "Phase Equilibria in Carbon Dioxide Expanded Solvents: Experiments and Molecular Simulations", Y, Houndonougbo, J. Hong, B. Rajagopalan, K. Wong, K. Kuczera, B. Subramaniam, and B.B. Laird, J. Phys. Chem. B 110, 13195-13202 (2006). "Monte Carlo Simulations of carbon-dioxide-expanded Acetonitrile", Y. Houndonougbo, J-X Guo, G.H. Lushington and B. Laird, Mol. Phys. 104, 2955--2961 (2006). Molecular dynamics computer simulation has become an invaluable tool in chemistry, chemical engineering, physics,materials science and biology; however, its uses are still limited by the relatively small system sizes and short time scales that can be simulated atpresent. Progress in this area therefore comes from advances in computer technology and in the development of efficient and stable algorithms. The latter is the goal of an multidisciplinary project involving the Laird group in collaboration with Prof. Ben Leimkuhler, an applied mathematician at the University of Edinburgh. "Generalized dynamical thermostatting", B.B. Laird and B.J. Leimkuhler, Phys. Rev. E 68, 016704 (2003). "Constant-temperature molecular-dynamics algorithms for mixed hard-core/continuous potentials" , Y.A. Houndonougbo and B.B. Laird, J. Chem. Phys. 117, 1001 ( 2002). "Molecular dynamics algorithms for mixed hard-core/continuous potentials'' Y.A. Houndonougbo, B.B. Laird and B.J. Leimkuhler, Mol. Phys., 98 309--316 (1999). "The Nose-Poincare method for constant temperature molecular dynamics'', S.D. Bond, B.J. Leimkuhler and B.B. Laird, J. Comp. Phys. 151, 114-134 (1999).